For a limited time, or until stocks last. 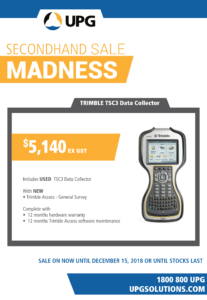 Contact 1800 800 UPG (1800 800 874) today! Integrated HDR camera – Trimble VISION™ technology provides fast image capture to colorise scans with minimal impact on field productivity. 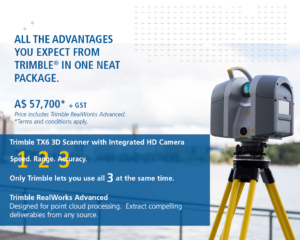 Effective ranges – choose from standard 80 meter range or upgrade to extended 120 metre range to match the standard scan range of the Trimble TX8. Be ready for any project with one of the industry's largest selection of point cloud processing tools which include registration, surface creation, surface to surface comparison and modelling.